Excellent dense syrup made from grapefruit juice and grapefruit pulp. It contains a high proportion of fruit component, 100 ml of syrup is made of 104 ml of grape juice and pulp. It is great for preparing refreshing home-made soft drinks. For example with high-quality gin, ice and soda you can prepare a delicious greapfruit cocktail. 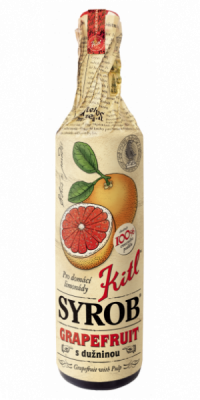 Excellent dense syrup made from grapefruit juice and grapefruit pulp. It contains a high proportion of fruit ingredient. 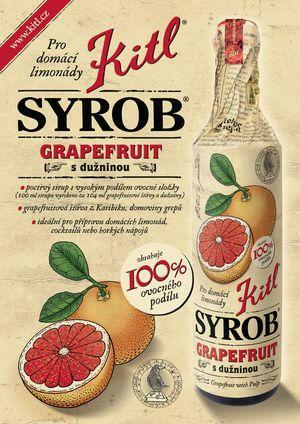 100 ml of syrup is made from 104 ml of grapefruit juice and pulp. It is great for preparing refreshing home-made lemonades. Poured over with hot water, with cardamom and decorated with a slice of lemon it can be enjoyed as a hot drink. With high-quality gin, crushed ice and soda, you can prepare a delicious grapefruit cocktail.